NICKY DOU SOLD THIS HOME IN ROGERS ARKANSAS IN LESS THAN 45 DAYS! 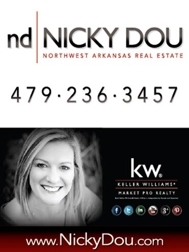 Want THE BEST LISTING AGENT IN NORTHWEST ARKANSAS? Check out this great HOME for sale in BELLVIEW in Rogers, AR! 3605 Amour Drive is a STEAL at only $83/sq.ft.